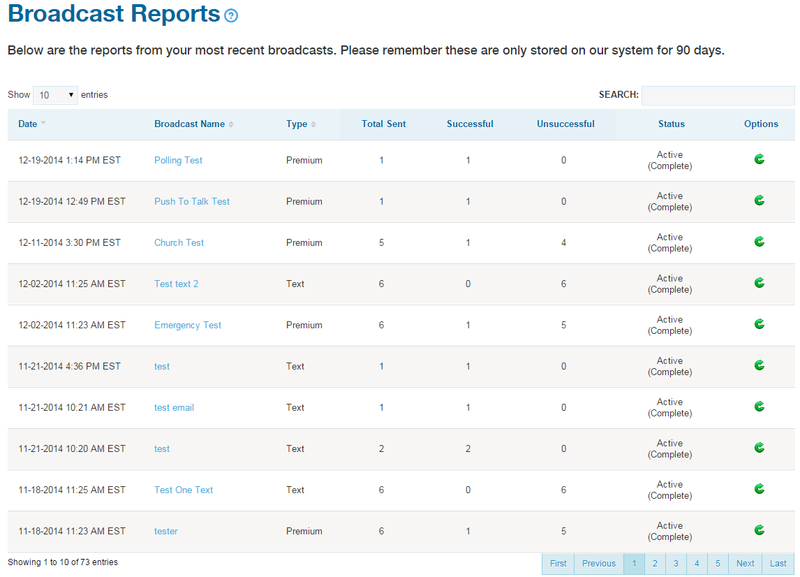 Every voice broadcast or SMS text broadcast that is sent out through DialMyCalls will generate a detailed report. The report will explain exactly what happened to every individual call or text that was placed during a certain broadcast. 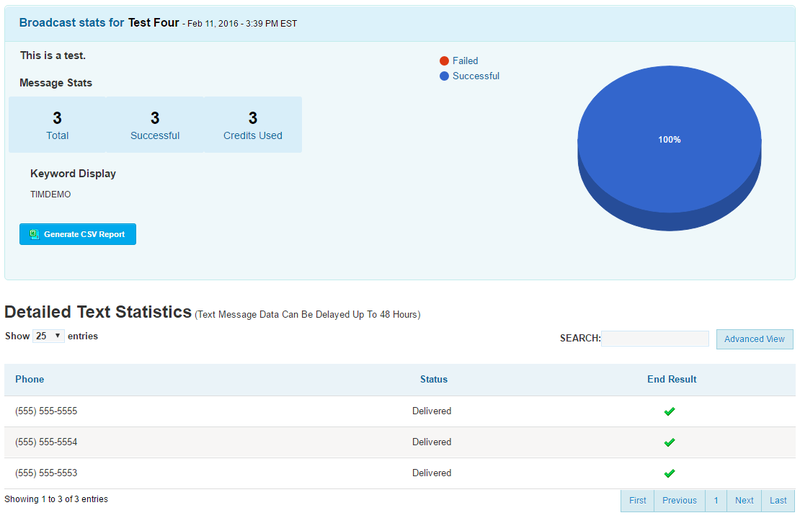 Displayed on the main “Reports” tab will be a quick overview for each report, this overview will display how many calls/texts were sent along with the amount that were successful and unsuccessful. Above Image: View detailed reports for all of your text message and voice broadcasts.. Above Image: View results of voice broadcasts – click “Advanced View” to display name, phone number and email address. Live Answer: Live answer means that this call was answered by a live person and not an answering machine or voicemail. Voice Mail: Our AccurateAMD has determined that this call was answered by either a voice mail or answering machine. This is based on message length and while usually correct, it is not always 100% accurate. Busy Signal: Our system made multiple attempts to call this phone number, but we received a continuous busy signal and were unable to complete the call. No Answer: This call was dialed successfully, however, it was unanswered on the receiver’s end. Not Connected: Our system made multiple attempts to call this phone number, but was unable to complete this call as dialed. The cause of this could have been a local network outage on the receiver’s end, line congestion, anonymous call blocking, or any number of reasons. Above Image: View results of text message broadcasts – click “Advanced View” to display name, phone number and email address. Delivered: Delivered means that this text message was successfully sent and delivery confirmed via the recipient’s mobile phone carrier. Undelivered: We were unable to deliver your text message to this recipient. This could have occurred due to the mobile provider rejecting the message or the network being too busy to deliver it. Enroute: Enroute means that this recipient’s mobile provider has accepted the text message and is currently in the process of attempting to deliver it. It is possible the message has already been received by the recipient and we are just awaiting confirmation. Non-Mobile: The message was not delivered because the recipient’s phone number was determined to be an invalid mobile phone number and is unable to receive text messages. 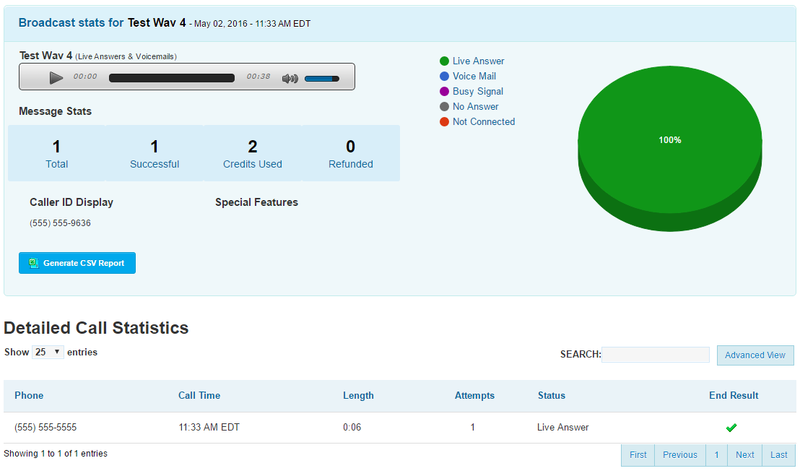 If you have any additional questions regarding your DialMyCalls broadcast reports, please contact us.